11am - Yesterday when I wandered thru the Mercado [market] in Panajachel, I was sure that I would find some apples for sale. 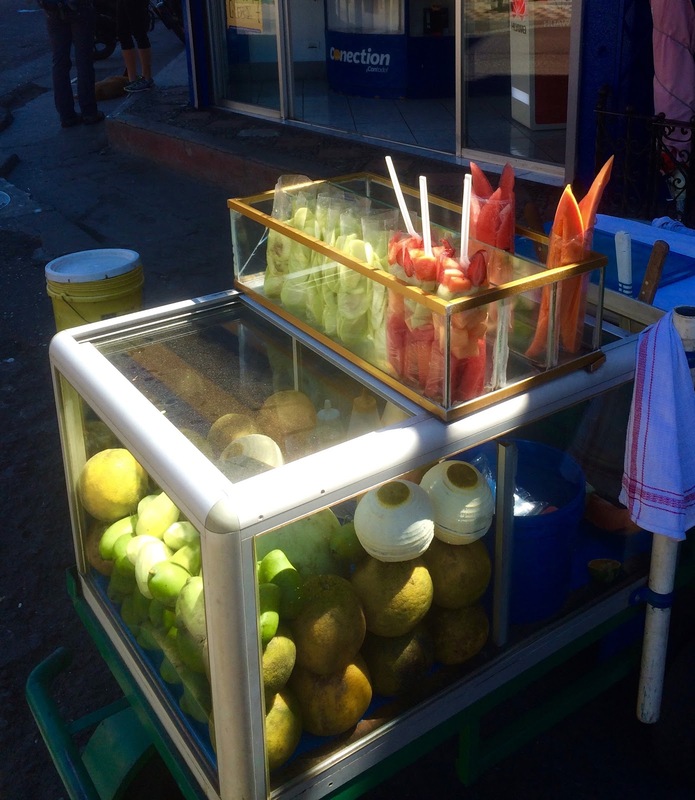 I had been looking for apples since I arrived in Guatemala on February 1st. Just now I found out about Guatemala apples. Growing season is March thru November. However, I am definitely getting my supply of fruits here in Panajachel. From the many cut fruit sellers along the main roads thru Pana. Just no apples. Noon - On the way to Cafe Kitsch, I bought a bag of mixed fruit. Strawberries, cantaloupe, mangos, watermelon. I was guessing that my sickness might be from eating the cut fruit here in Pana. But now I do not believe that is likely to be the case. If people were getting sick from eating one seller's fruit, that seller would soon be out of business. More likely, this sickness comes from my period of adjustment to the environment of Guatemala. I have taken two doses of the medication that I bought yesterday. So far....so good! After walking around Pana for awhile, I found that I had accumulated over 4,000 steps. Turning around, I headed back to my room. On the way, there is a drinking place on the 2nd floor, just above Cafe Kitsch. I went up there for a look-see. That's when I captured a nice high view pic looking toward the big intersection of Calle Principal and Avenida Santandar. Note: The intersection pic above may be clicked twice to super enlarge. 7pm - There is only one hot dog stand in the downtown section of Panajachel. And I don't know why? For about three years, after I first began RVing, I lived in the Town of Santa Rosalia on the western shore of the Gulf of California. In Santa Rosalia there were two competing hot dog stands. And the hot dogs that were sold at these stands were spectacular! The dogs were wrapped in bacon and cooked until the dog was on the black side of darkness. I do not know what they did to those dogs? But there were always large crowds of customers on the weekends. And I loved those dogs. Was addicted to them! The hot dog that I ate this evening here in Panajachel, did not do anything special for me. Whatever was the magic of Santa Rosalia's hot dogs did not make it down to Guatemala. I received an app named "Nite Time" for use on my iPhone. 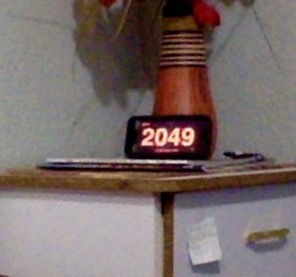 This app is a clock with highly visible red numbers. Ordered free from iTunes. Nite Time is able to run all nite long without running down iPhone's battery. In reading your blog, it appears you like dairy products. Lactose intolerance = explosive diarrhea. simple test = stop dairy for 2-3 days - worked for me. Good luck healing up your digestive issues. I seem to be recovering now, with the aid of the medicine that I began taking yesterday. Thank you! I am having one good time staying here in Panajachel, Guatemala. I decided that even though I no longer had MsTioga, I could still easily travel. You seem pretty cool George! Apple pie wouold definitly hold my gaze for longer. Apples are delicious.